The Springer Mountain Farms Bluegrass Nights at the Ryman 2014 concert series kicks off on June 26 with twenty-time Grammy® award winner singer-songwriter and Country Music Hall of Fame member Vince Gill. The annual Red, White and Bluegrass show on July 3 will see progressive Bluegrass group Yonder Mountain String Band make their Ryman headlining debut with special guests Sam Bush, Jake Jolliff and Allie Kral. On July 10, Steep Canyon Rangers, Grammy® winners for Best Bluegrass Album (Nobody Knows You), and two-time Grammy award winner and hit songwriter Jim Lauderdale will co-headline the show. Rounder Records recording artists and three-time IBMA Entertainer of the Year winners Dailey & Vincent will take the stage on July 17. On July 24, dobro master Jerry Douglas presents Earls of Leicester, a bluegrass supergroup performing the music of Flatt & Scruggs from 1954-1965 comprised of Douglas, Grammy-award-winning producer Shawn Camp, Johnny Warren, son of Paul Warren, legendary fiddle player in Flatt & Scruggs Foggy Mountain Boys Band, acclaimed banjo player Charlie Cushman, Barry Bales of Alison Krauss & Union Station fame, and A-list sideman Tim O’Brien on mandolin. Perennial favorite and fourteen-time Grammy® award winner Ricky Skaggs and his eight-time IBMA Instrumental Band of the Year Kentucky Thunder close out the series on July 31. CMA Air Personality of the Year award winner Eddie Stubbs will once again host each show of the series. All shows begin at 7:30 p.m. and are preceded by 650 AM WSM’s Pickin’ on the Plaza featuring regional bluegrass bands from 6:00 p.m. to 6:45 p.m. The free showcases take place in the Ryman parking lot. Puckett’s “Trolley Parton” will be on site during Pickin’ on the Plaza. Come early to Springer Mountain Farms Bluegrass Nights at the Ryman for our Pickin' on the Plaza showcase for your chance to become Chicken Rich! 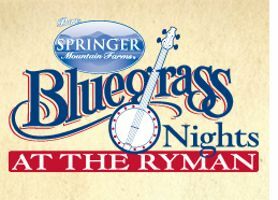 Each week, a top regional bluegrass band will perform on the Ryman plaza starting at 6:00 p.m. where you can register to win a "Chicken Rich" prize pack including a tee-shirt, Hatch poster and a cooler of delicious Springer Mountain Farms chicken delivered to your door! The winner's name will be called from the stage that night by a Springer Mountain Farms representative and legendary 650 AM WSM announcer Eddie Stubbs!